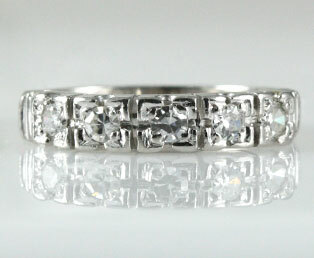 This splendid 1940s estate platinum wedding band has a sweet 1945 date inscription. Five round diamonds are adorned by square patterns that emphasize the fire and size of the diamonds. Measuring 3.82mm wide, this special wedding band is wide enough to be worn alone or worn to enhance your engagement ring.